In the words of Bon Jovi, woah, we’re halfway there. I’m midway through my novel’s first draft. It feels much like crossing the 13.1 mile mark in a marathon – a sense of achievement, tempered by the realization that I have to do the same thing all over again. Still, I have a good idea of where I need to go and how I’m going to get there, and it isn’t going to involve any blisters or horrible sticky energy gels. Seriously, who thought peanut flavor was a good idea? I’ve had to double back a few times, re-writing and rearranging scenes that didn’t sit right. Those occasions have required a quick trip into LibreOffice Writer (try it – you won't believe it's not Word), but the rest of the time I’ve stuck with the superb distraction-blocking writing software FocusWriter. FocusWriter's design means you can't just open your web browser for a little quick research, accidentally get lost down a hole of Facebook and cat videos, and end up wasting half an hour of precious writing time. You can set yourself goals, blank out everything except the section you're currently working on, and give yourself a hearty pat on the back if you achieve a 'streak' by meeting your targets for several days in a row. There's a built-in spellchecker and an auto-save function so you don't lose anything if Windows decides its updates are more important than your work. It really is a brilliant little tool, so I caught up with its creator Graeme Gott to find out what inspired him to create it. Hi Graeme! Thanks so much for your time. What prompted you to create FocusWriter, and what were your main aims in doing so? My wife was frustrated with the word processing options for Linux. The ones that she had available to her at the time were all either bloated, overcomplicated, or buggy – plus, she was struggling with distraction issues. I don't remember exactly when and how the idea was sparked, but I set out to create a writing environment for her that would be fast, simple, and comfortable to use. Someplace where she could go to immerse herself in her imaginary worlds. Every major design decision has been based on her real-life needs and experiences, and that's really where FocusWriter gets its focus. How has FocusWriter evolved over the years? Has it developed in any unexpected ways? I've always striven to maintain simplicity with FocusWriter, but in the beginning I mistook simplicity for a complete lack of features. The biggest surprise for me was simply learning what worked and what didn't for writers. I'm pleased by the collection of features it's gained over the years, though I do have to be careful. It's tempting to add every feature suggestion I get, but if I did, the program would lose what makes it FocusWriter. I have a strong vision for what the program is, at its heart, and the features I've added (and the ones I haven't) have all been in service of that vision. How did you get involved in open source programming? Honestly, I just jumped right in! I'd already been using both Linux and open source programs for years, so I decided that I wanted to ‘give back’ to the community that had supported me for so long. I think that if you're interested in open source, you should figure out where your passion lies, and just go for it. Actually, that's kind of my life advice as well. Which of your other projects should our readers check out? The writers in the crowd might be interested in NovProg: basically, a progress chart for writing your novel. Specifically, it's based off of NaNoWriMo (National Novel Writing Month), wherein writers commit to writing a 50,000 word novel within 30 days. NovProg has a bit more flexibility than that, but it's still designed for those times when you want to set a goal and meet it. Speaking of NaNoWriMo, this year's challenge is nearly upon us. In November, people around the world will take to their keyboards to "find their voices, achieve creative goals, and build new worlds – on and off the page". It's taken me four months to hit 50,000 words at a comfortable pace with some ad-hoc revisions (my first draft will sit around 90,000), so I have nothing but respect for anyone who can turn around that volume in just 30 days. Granted, I'm not aiming for speed, but completing NaNoWriMo is an enormous achievement. If you're planning to give it a try, best of luck! Cat Ellis has turned to technology to help write her first novel. 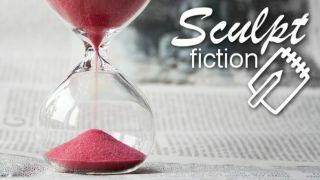 Follow her progress in her Sculpt Fiction column.